6th Battalion Yorkshire Regiment, , formerly 5th Battalion Gloucester Regiment. 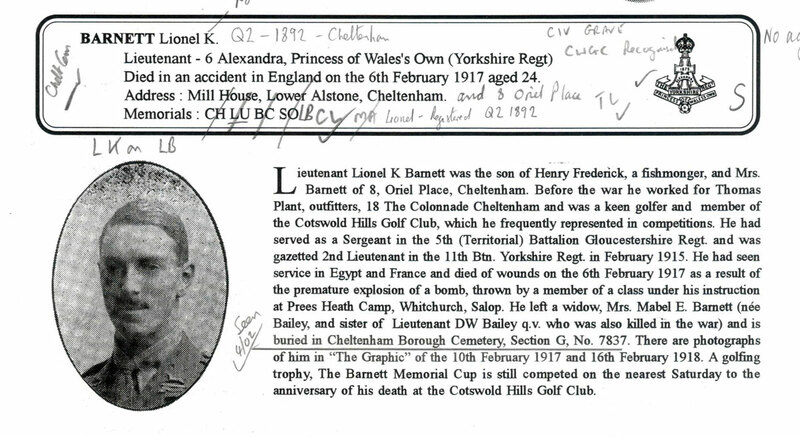 Husband of M. E. Barnett, of Mill House, Lower Alstone, Cheltenham. Died of wounds 6 February 1917. Aged 24. A biography of Lieutenant Barnett can be obtained by clicking on the image on the left. This has been provided by Jimmy James, <jimmy@remembering.org.uk>, to whom we are extremely grateful.